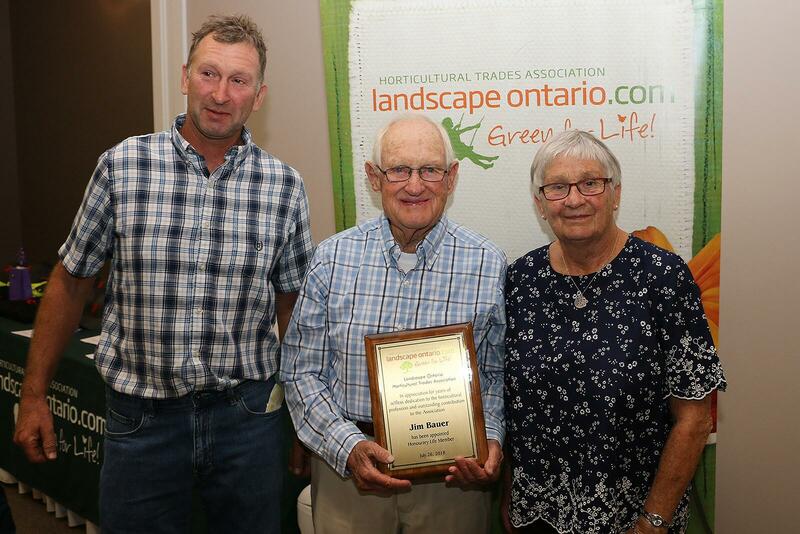 Jim Bauer, LO's newest Honorary Lifetime Member (centre), with son Bud and wife Anneke. An individual considered for an Honorary Lifetime Membership must first be nominated, then approved by LO’s Provincial Board of Directors. Hansen explained that when the time came for the board to vote on Bauer, the decision was unanimous. “Not one person in the room did not put their hand up,” Hansen explained. Mr. Bauer has volunteered countless hours over decades to improve his profession, his association and his community, and is the cornerstone of the Ottawa Chapter. “One of the first Congresses I ever went to, Jim walked into the room and everyone in the room knew who he was,” Hansen explained of his first encounter with Bauer. The announcement came with a thundering applause from the many golfers, volunteers and facility staff in attendance. Mr. Bauer was joined by his wife Anneke, and son Bud.